While Redline Guide Arlette Laan was taking her long walks with her husband, Rich, more of our guides were doing their own thing — this is why we need so many guides, half are always out playing. Specifically, Redline Guides Liz Wyman, Ken Hodges, and Jeffrey Shutak were off in three different directions having three distinct adventures of their own. Let’s start with Liz, since she was more local finishing a five-year effort in Maine. 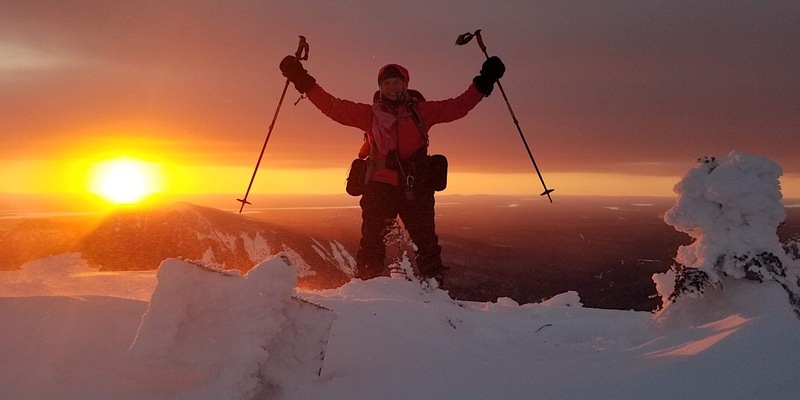 With the help of Redline Guide Álvaro Marques and other friends, Liz recently completed her quest to hike New England’s Hundred Highest peaks during the winter months (mind you this task took five winters). For those not in the know, some of these mountains are trailess and in some cases quite remote. This is true of Liz’s final trip which saw her in Baxter State Park in Maine, home of the mighty Mt Katahdin. There she hiked the two remaining peaks she needed: South Brother (3970′) and Coe (3796′). The latter is where she finished. This twenty hour hike involved a lot of trail-breaking through knee-deep snow. Atop Mt Coe, a proud moment to be sure. Congratulations Liz! Photo by Erik Bertrand. Well done, Liz. Congratulations on this really tough list. While Liz was out finishing her list, Jeffrey was on the other side of the Atlantic visiting Spain with his girlfriend, Bonnie. There, with the help of Guía (Guide) Pere Sauret Manén of Barcelona Walking, he traversed the Matagalls Les Agudes via Castellets. This covers three summits, the tallest one topping out at 5600-feet. Short mountains, yes, but this was a roped climb on some very rugged terrain (a subject we know a lot about here in the northeast)! 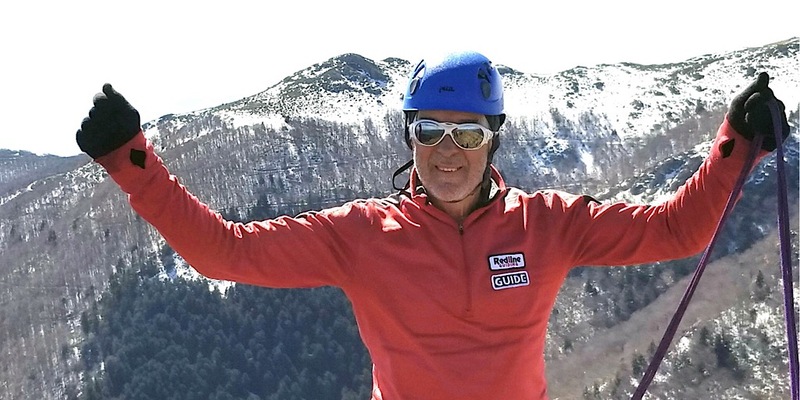 Jeffrey has plans to go back in a year for some more, next time hoping to summit the tallest peak in the Pyrenees. Jeffrey giving Redline Guiding some exposure abroad. This photo was taken near the top of their climb. What a terrific traverse, Jeffrey. Well done! Just as Jeffrey was coming home and Liz was celebrating her time in Maine, Ken was heading west with the intention on guiding himself and a friend to what’s left of the volcanic summit of Mount St Helens (8363′) in Washington. If that mountain sounds familiar, it used to be bigger (9677′) but blew its top in May of 1982 in an enormously violent eruption. Fortunately, when Ken did it they had no volcanic activity. In fact, even the late winter weather was incredibly mild affording them comfortable conditions with stellar views. A “bluebird day” as some say. 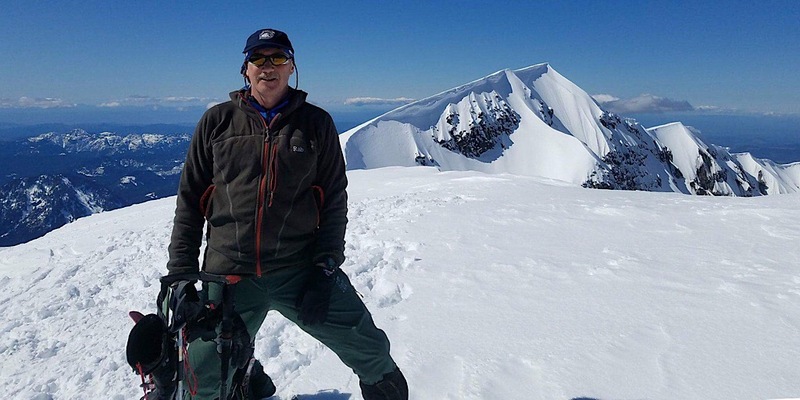 Ken on the summit of Mount St Helens… in March! Photo by Tomoko Nakajima. A fantastic mountain in great weather, Ken. Good job!